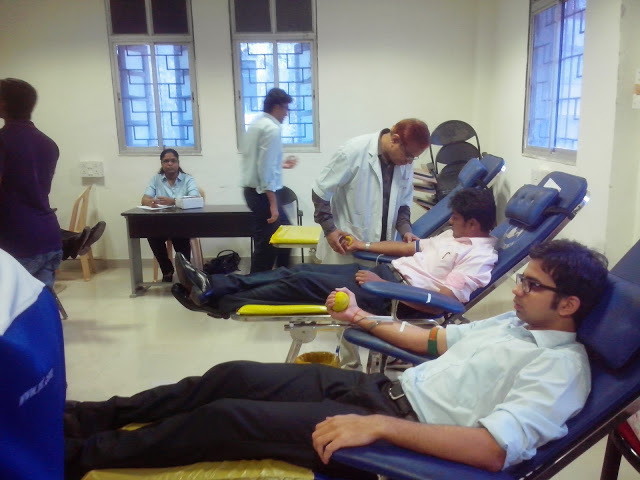 SSR (Students Social Responsibility) committee Of SIMSREE in association with Tata Memorial Hospital and Think Foundation carried out a blood donation camp and thalassemia checkup on SIMSREE campus on 11th September, Wednesday. The camp started with a very informative power point presentation. This presentation helped break myths about blood donation and it educated the students about the importance of blood donation. The presentation also had detailed information about thalassemia. The NGO is trying to ensure that no child is born with thalassemia and the students were encouraged to check whether they were thalassemia minors by conducting free tests. After, the presentation the blood donation session was carried out. The students exhibited their participation in abundance. This camp spread the feeling of contentment among the students of SIMSREE. Last but not the least, special thanks to Dr. Sangeeta Pandit who guided SSR committee throughout the entire process.